CMFC is focused on building the Kingdom of God here in the Archdiocese of St. Louis and beyond. 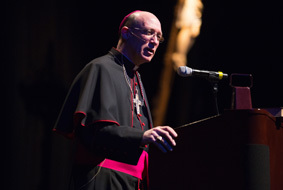 The mission of Catholic Men for Christ is to help build and strengthen The Kingdom of God in the Archdiocese of Saint Louis and beyond by engaging, educating, and encouraging all Catholic men to live their faith and to lead their families in accordance with the orthodox teachings of the Catholic Church. CMFC are men of faith, men of action, catalysts for good, and warriors against evil. The attendee will be more open to guidance of the Holy Spirit in their life. The conference is intended to introduce, educate, embolden, and refocus the attendees on their roles as the spiritual leader of their home and community. The attendee, once energized, will help to build the Kingdom of God through a renewed personal faith and vocation to his family. The attendee will be empowered as the faith leader of his family. The attendee will be encouraged to participate in acts of charity and service in his parish, community, and diocese.